The Umhlanga Rocks Area north of Durban in KwaZulu-Natal offers something for everyone. Near-perfect weather all year round makes this tropical paradise especially alluring for sun-worshippers, surfers, scuba divers and fisherman, who can take advantage of the endless opportunities like the magnificent Blue Flag beaches, rock pools and breathtaking coral reefs. Eco-tourists are also well catered for with many conservation reserves and birdwatching spots. Nature lovers will enjoy walking the Umhlanga Rocks Lagoon Nature Trail - a fascinating hour-and-a-half journey through coastal forest on boardwalks that cross the Umhlanga Ohlange River. Lying just beyond the reserve is the Umhlanga Rocks Hawaan Forest which dates back 18 000 years. Here visitors enter an ancient world of plant, animal and bird life, and over 100 indigenous tree species. For the avid golfer, the Umhlanga Rocks Area offers several world class golf courses. Challenge yourself at the prestigious North Coast Zimbali Country Club, where the inward nine provides a scenic distraction, or at nearby Beachwood Golf Course located on prime coastal estate right on the water’s edge. Golfers 'in the know' refer to the up-market Umhlanga Rocks area town of Mount Edgecome as a golfers dream destination, with not one, but two outstanding championship golf courses available for both the serious and the social golfer. On the odd rainy day, visit the Umhlanga Rocks Gateway Theatre of Shopping. Game in style at Sibaya Casino. 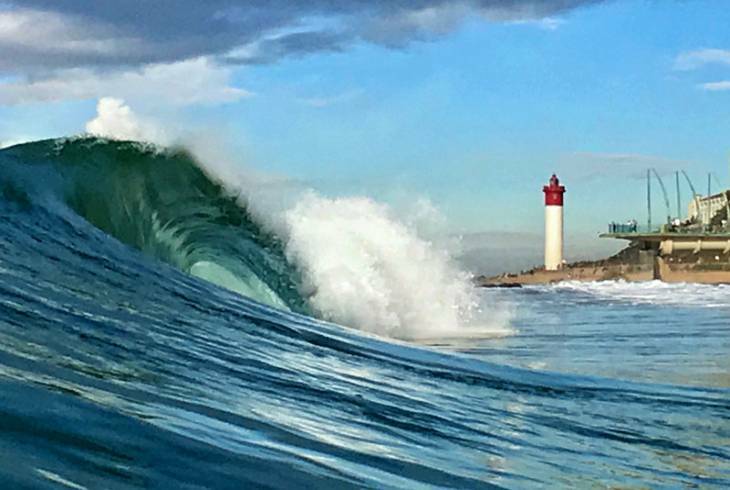 Catch a thrill at the Umhlanga Rocks Natal Sharks Board. With glorious beaches, nature reserves, shopping malls, hospitable pubs, exciting clubs and excellent restaurants, the Umhlanga Rocks Area is a prime holiday destination, and encompasses Umhlanga Rocks - a premier holiday resort dubbed the 'Riviera' of the KZN North Coast for good reason. Known in Zulu as the 'place of reeds', Umhlanga Rocks not only offers visitors a wonderful beach holiday, but a gateway to the KZN North Coast world heritage sites and safari adventures. Umhlanga Area overview. Umhlanga Area Accommodation and Information.